The fourth instalment of the Buzz! Junior series franchise has once again "buzzed" its way onto the PlayStation 2 which once again targets the younger gamer market with this entertaining title which will improve your child's reflexes, coordination and knowledge skills through 35 different games. For those that are unaware of the Buzz! franchise, gamers are each given a buzzer with different coloured buttons located on it. Once the player pushes the buzzer, they must select the corresponding colour with the answer. 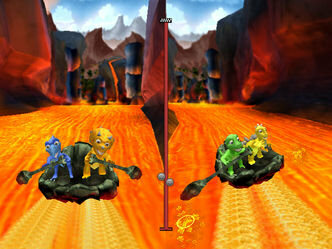 However with Dino Den, the games are all about fun and not like the traditional Buzz! quiz games. It's definitely an entertaining and amusing party game with this latest version focuses on prehistoric events and creatures. Thirty-five dino-tastic games - dunk cavemen, race go-karts, and ride a T-Rex! The title also features some great playable functionalities such as gamers having the ability to play a variety of mini-games such as stone age go-karting, T-Rex riding and my personal favourite caveman dunking. Players are scored with Dino eggs and the winner with the most Dino eggs is crowned king of the Dinos. There are also a variety of different gameplay modes in Buzz! Junior Dino Den that include a new team mode option that allows players to compete against another team which truly gives some added fresh air to the Buzz! series. Buzz! 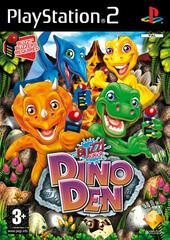 Junior Dino Den allows up to four people to play this entertaining title for the PlayStation 2 and if you're short of players, there is a computer generated player to assist. Graphically, the title is rather impressive on the PS2 and is probably the best looking Buzz! game with colourful graphics, great special effects and some interesting gaming environments. 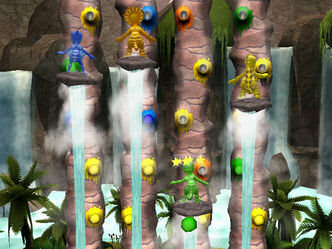 The sound also compliments the game with its quirky sound effects and strange prehistoric noises and music. In conclusion, Buzz! Junior Dino Den is an entertaining title for kids that feature some easy to sometimes tricky games. For a recommended retail price of $49.95AUD if you already own the buzzers, this is a great game at a great price.